Canberra Airport works with Airservices Australia to put in place extensive noise respite measures to minimise the impact on the community. The most significant and effective measure is the long established noise abatement areas. Jet aircraft flying within the noise abatement areas are not permitted to fly below 5,000ft above ground level, and other aircraft are not permitted to fly below 3,000ft. This protects 99.5 per cent of the houses in the Canberra and Queanbeyan community from direct over flight (other than for emergencies or thunderstorms). As a result, aircraft flight paths into and out of Canberra Airport are concentrated into the corridor between the Canberra noise abatement area and the Queanbeyan noise abatement area. People who buy houses outside these noise abatement areas must inform themselves of the likely increased noise exposure and the future increase in flights. Historical changes to operations at Canberra Airport to reduce the impact of aircraft noise on surrounding communities can be found in our Fact sheet. Canberra Airport is a non-curfew airport. This means it is in operation 24 hours a day, with operations increase significantly over time. Not only will the number of planes per hour increase but they will be bigger aircraft and they will operate more at night as international and freight operations grow. There are several measures to describe aircraft noise including information about flight paths and single event noise contours. N contours for Canberra Airport have been prepared in response to Guideline A of the National Airports Safeguarding Framework, Measures for Managing Impacts of Aircraft Noise. N contours are a representation of aircraft frequency (how often) and noise level. These contours compare 2012 contours with airport capacity contours. They are therefore a good representation of how noise will change over time as the airport becomes busier and aircraft frequencies increase. The Canberra Airport Australian Noise Exposure Forecast (ANEF) illustrates noise levels based on noise insulation standards outlined in AS2021. Unlike N contours the ANEF contours are not a reflection of noise experience, but rather are a set of contours based on an average of aircraft noise when the airport is at capacity. In late 2012 the NSW Government approved in part the rezoning of land at Tralee for residential development. The decision was made that residential development will not be permitted at Tralee within the ANEF 20 contour, while development outside the ANEF 20 contour will require aircraft noise attenuation. This land is subjected to aircraft noise at any time by the 24 hour a day, 7 day a week passenger, freight and defence aircraft flight operations arriving and departing Canberra Airport. The frequency of aircraft movements and the size of aircraft are forecast to increase indefinitely into the future. It is the responsibility of landowners to noise attenuate their property to ensure their amenity as Canberra Airport will remain curfew free. In 2013 the NSW Government released for public comment a draft 117 direction under section 117(2) of the Environmental Planning and Assessment Act 1979. The draft 117 direction confirms that no new residential development will be approved by the NSW Government within the ANEF 20 contour for Canberra Airport. The proposal has not been finalised. Airservices commenced operation of a Noise and Flight Path Monitoring System at Jerrabomberra in 2002. The pattern of aircraft flight tracks described by this system is published quarterly on the Airservices website. In early 2006 Qantas introduced trial flight paths into Canberra Airport utilising new technology known as Required Navigation Performance (RNP) procedures also referred to as “Smart Tracking”. The Qantas RNP approach from the south to Runway 35 curves around houses at Jerrabomberra, providing a constant descent approach (CDA) that is substantially quieter and expends significantly less fuel than straight-in approaches. In 2007 Airservices produced a report showing reduced aircraft noise of 9-10 dB(A) at the Jerrabomberra Noise Monitoring Terminal during a single 737-800 RNP arrival event. In 2013 Smart Tracking was implemented at Canberra Airport and is in use by aircraft fitted with the necessary navigation equipment. Further information about Smart Tracking can be found on the Airservices website. 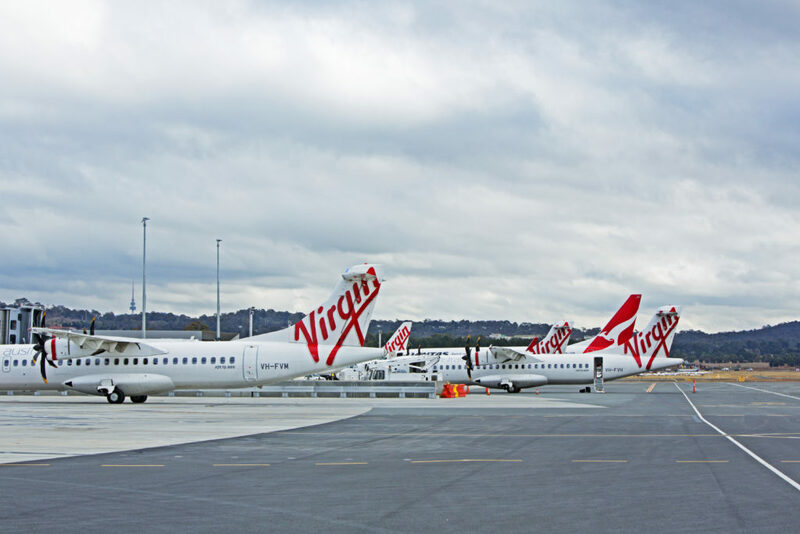 Airservices Australia has released an online system called WebTrak, where anyone can access information about where and how aircraft fly within 55km of Canberra Airport. WebTrak provides information about arriving and departing aircraft, from as long as three months ago to just 40 minutes ago. After selecting an aircraft, users are able to make a complaint about that flight directly to Airservices. – the presentation and distribution of aircraft noise related information. The 2013 article The Truth About Aircraft Noise is informative. In 2013 members of the aviation and airport industry joined together to release a new aircraft noise information portal for the Australian community. The Portal provides information about particular aircraft, airports and noise policies, however, its intent is mainly to act as a hub where members of the community can find out more about the many facets of aircraft noise. For more information on Canberra Airport’s activity in minimising the impact of aircraft noise on the community, please click here. For more detailed information on our future plans, please see our Master Plan [Noise Chapter]. These are an industry approved representation of noise level and aircraft frequency or number of events (how often on an average day). The N contours used in this tool represent ‘practical ultimate capacity’ (when Canberra Airport is at its most busy in the future), and allows you to determine whether your home or proposed home will experience 60, 65 or 70 decibels of aircraft noise now and in the future. It also shows how often (number of ‘events’) this noise would occur on an average day. 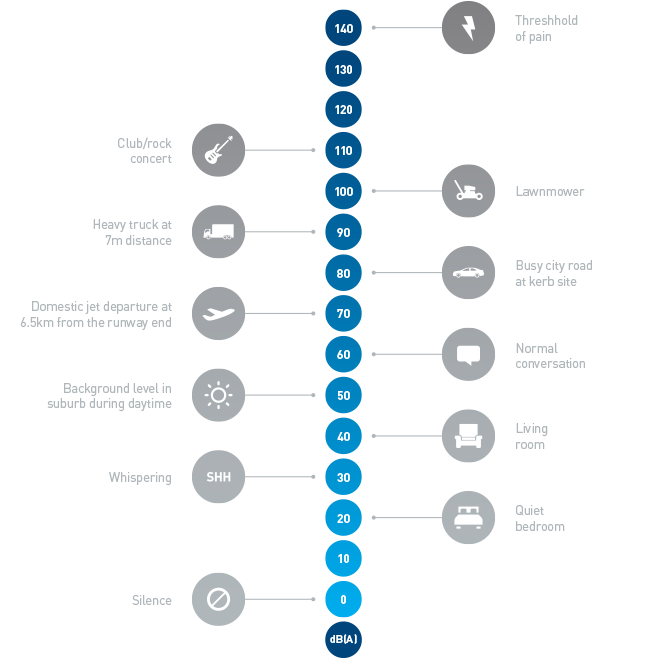 In order to understand what the various levels of decibels db(A) mean in terms of a single noise event, please refer to our chart below. You will be given an estimated number of events on an average day. This is based on the average number of flights per day over that address (within a 20 metre deviation area). The map shows three zones – the darkest one being the area with 100 events per 24hr period at whatever decibel level you have selected. The less dark one shows 50 events per 24hour period and the lightest area shows 20 events per 24hr period. Please note that as noise is not a tangible object if your address is close to a line, please assume the highest number of events.